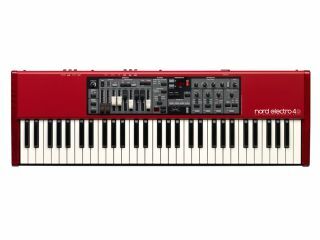 The Nord Electro 4D: the stage keyboard for the player who doesn't want to put their back out. Has it really been 10 years since the launch of the first Nord Electro? Apparently so and, to celebrate, Clavia is announcing a new model known as the Electro 4D. One of the Electro's big selling points has always been its portability, and this 7kg 61-note keyboard maintains the lightweight tradition. It has a semi-weighted waterfall key action, and proper drawbars for hands-on control. Speaking of the organ, this section now has a tonewheel engine that's derived from the Nord C2D, while click modelling has been improved and there's a new rotary speaker simulation with a new drive feature. Other highlights include compatibility with the Nord Sound Libraries collection and a new delay effect. Check out the press release below and head over to the Clavia website for more. In time for the 10th anniversary of the very first Electro we proudly introduce the new Nord Electro 4D SW 61. The ultra lightweight (7kg) Electro 4D sports a 61-key Semi Weighted Waterfall key bed and the sturdy, great feeling drawbars found on the Nord C2D for full hands-on control, as well as support for both our constantly expanding Sound Libraries. Sound-wise the Nord Electro 4D has a number of improvements under the red hood: The Organ section features a brand new tone wheel engine derived from our flagship organ Nord C2D. The Click-modeling has been improved and there's a brand new Rotary Speaker simulation with an amazing new Drive. The Nord Electro 4D supports Long Release suitable for legato playing and selectable String Resonance. Handling programs is easy with 4 Program Banks and 4 Live Locations. The Effect section now includes a flexible new Delay Effect with tap-tempo, rate, amount and a stereo Ping-Pong mode and the USB port doubles as an USB-MIDI interface. Keep checking MusicRadar.com's Musikmesse 2012 hub for all the show highlights.